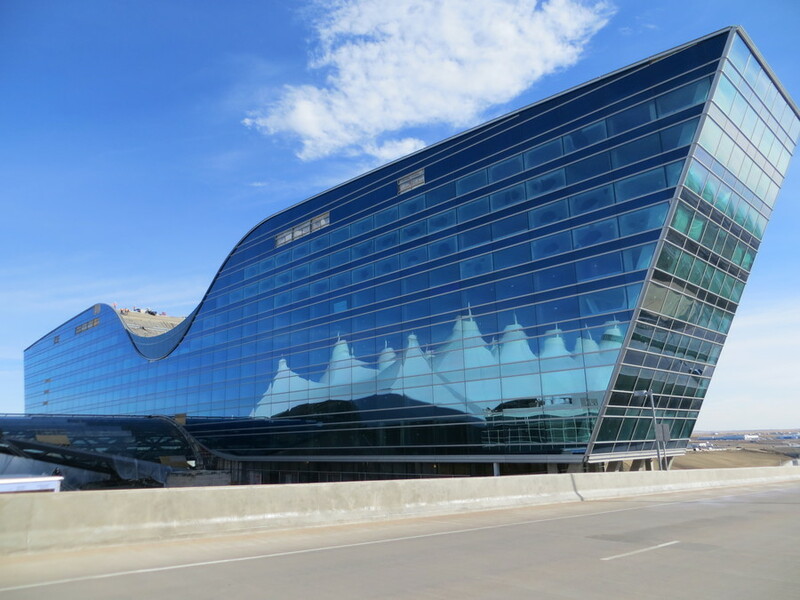 The DIA Hotel and Transit Center represents architectural achievement over complex regulatory and logistical constraints. The DIA Hotel and Transit Center represents architectural achievement over complex regulatory and logistical constraints. The goal of the hotel construction was to create a structure with enough space for a 500+ room hotel as well as a convention center and a separate transit center. The challenges faced by the architects and engineers were height limitations set by the FAA for airfield visibility and existing bridges to either side of the construction site. So, the distinctive swale, for example, didnt come about just to create a structure that looks like wings. The height limit at the swale was set at the time DIA was constructed to establish a view corridor. The issue created is that an entire hotel at the height of the swale would not have had enough rooms to be economically feasible and the footprint couldnt expand because of the bridges. Accommodating all of the needed space in the structure required both going up and angling outward from the base. The design, originally started by Santiago Calatrava and taken over by the Gensler architecture firm, had to accommodate all those requirements. In the end, the final results achieved both the space requirements and one a of a kind masterpiece of architectural art.